Coach Brent shares tips on the college football recruiting process for kickers and punters. 1. Make the first few kicks in your highlight video count! A highlight video needs to draw the viewer in. If you have too much going on up front, or show your kicks sequentially, game by game, versus best to least best, you’ll be lucky if the coach makes it past the first few kicks. A college football recruiting coach or special teams coach will determine if he wants to proceed further based on your first few kicks. So the point is, make your first few kicks/punts/snaps count and make sure they grab his attention! Think 50 yard field goal, kickoff out of the end zone, game-winning 40-yarder, etc. 2. Don’t go overboard with video length. A highlight video is designed to showcase your best plays – kicks, punts, snaps/tackles. You do not want to make it 5 minutes long. Ideally, a good season highlight video is 2 to 3 minutes long! Think of it like a movie trailer. A good movie trailer draws you in within 30 seconds and makes you want to go see that movie! Approach your highlight video the same way. If you were fortunate enough to get several kicks in-game this season, pick out your best 10 field goals, 5-7 PATs, and 10 kickoffs. If you’re also a punter, throw in your 10 best punts. Save the ‘full-featured video’ for when a coach expresses interest in you. You can then direct him to your game by game highlight video showing each kick throughout that season. 3. Leave no mystery to your video. Unfortunately HUDL is not always the best video quality – many times coaches or student video crews film your games, and the kicking / punting is an afterthought. They’re more focused on the ‘line of scrimmage’ and don’t pan enough to capture the flight of the ball. A college coach will not be able to properly evaluate your ability (hang-time, trajectory, distance, etc.) if the ball is not in frame. So make sure your parents or a friend films each of your games and pans out enough and uses a quality video camera with crystal clear HD. Also, do not try to fool a coach by only posting big kicks or punts with the wind at your back. Coaches know – they will look at the flags, watch your jersey flapping, and they will dismiss the video. Of course, some games you may have windy conditions, and that is fine, but if the only kicks you are sending out are in hurricane-like winds, have a reality check and realize the coach will think you’re trying to pull a fast one and will move on to the next student submission. 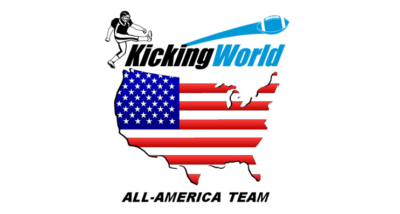 Check out our Recruiting page on the KickingWorld.com website for even more recruiting tips including ‘How to Make a Kicking Highlight Video‘. 5. E-mail the right people. You should e-mail the Special Teams Coordinator, Recruiting Coordinator & any special teams and recruiting assistant contacts… at least 4x a year. If a school doesn’t respond to you after 4 attempts, most likely they are not interested. However, do not give up after only 1 or 2 attempts! Also, you should never e-mail the Head Coach unless he e-mails you (or if it’s a real small school). They have a lot going on and typically don’t interact much until after you’ve committed. Also, it would be obnoxious to CC 4+ various coaches in one e-mail. You should hone in one 1 or 2 coaches per e-mail, and not just e-mail each e-mail address you find. Keep it focused to Special Teams and Recruiting related! How do I find their contact info and what should I say in the e-mail?!? This is covered at length in our 2-Day camps, at private lessons, or on a recruiting consultation call (small fee) with me! 6. Record your season-stats. Be sure to have it in detail (review a Hot Prospect profile for example). These stats should include your PAT attempts/makes/blocks, FG attempts/makes/blocks, # of Kickoffs / % of Touchbacks, # of Punts, Gross Punt Yards, Net Punt Yards, # inside 20, # of touchbacks. These are the core stats a coach would ask of a kicker or punter. Use my App, Kick Tracker (iOS/Android) to track your stats, or simply log them in a spreadsheet like Excel or Google Docs, or a notebook. You should include a simplified, bulleted list of your season stats in any e-mails you send out to coaches (these stats are built into Hot Prospect profiles). By doing this, a coach is able to click on the hyper-linked time and it will quickly jump them to that portion of your video. If you are primarily a punter and the first 3 minutes of your video is kickoffs/field goals, a coach will not sit through those 3 minutes to ‘find’ your punts. So make it easy for college football recruiting personnel to find the info they need on you. 8. Make it personal. One trick that has worked for several of our students is quite simple, but not many recruits do it. Get in front of the camera and just talk for 25-40 seconds. Make it a quasi-interview and simply talk about yourself (in a non-arrogant way of course) and allow the coach to get to know you. You should discuss what your strengths/weaknesses are, your hobbies/interests, what you like most about kicking, what major you are hoping to get into, and why you think you would add value to your future college football team. Believe it or not, this little trick exponentially increases a response rate. It also works well when trying to find a job – versus just e-mailing a resume, include a ‘video resume’ too! Try it and stand out from the crowd! I do A LOT for our Hot Prospects in way of utilizing my connections to college coaches, pro-active e-mail and snail mail marketing campaigns, phone calls & texts to college coaches, online marketing and visibility on our website and more. So if you’re fortunate enough to make the Hot Prospect List, realize you have some big guns behind you helping you out in the background. If you did not make our List, but have come to our camps (and did well), I also e-mail out recruit contact info / camp stats to colleges. So if you had a good performance, many times throughout the year I e-mail or call up college coaches with hand-picked campers or lesson students who impressed me and the staff. A college coach receiving a personal recommendation from a reputable kicking coach means a lot, so we invest a lot of time and money in helping you get noticed! Hopefully the college football recruiting tips above helped to spark your creative mind so you can be strategic in your outbound efforts of reaching coaches. Remember, college recruiting doesn’t just ‘happen’, you need to ‘make it happen’. Be pro-active and get your name out there! A coach will remember the last person in his e-mail or voice mail, he won’t remember someone from 6 months ago. So stay current, stay in front of the coach and be persistent!